Will tiny wannabes ever topple the giants? Fujitsu's Eternus disk array has topped the SPC-2 benchmark charts, with an IBM SVC-Storwize V7000 combination in second place. The SPC-2 storage benchmark measures how an array performs doing large sequential I/Os and looks at three workloads: large file processing; large database queries; and video-on-demand. The benchmarks deliver an aggregate megabytes per second (MBps) and a price/performance value. The current top of the SPC-2 pops is a Fujitsu Eternus DX8700 S2 array, which delivered 16,038.74 SPC-2 MBps with a price/performance value of $79.51. The configuration featured 762 x 300 GB 10,000 rpm 2.5” SAS disk drives. Spindle numbers count. An IBM SAN Volume Controller (SVC) v6.4 with a Storwize V7000 disk storage array delivered 14,581 SPC-2 MBps with $129.14 a price/performance rating, putting it in second place. You can read the exec summary of the IBM run here (pdf). The previous best performers were an HP P9500 XP (OEM'd from Hitachi's VSP) and a Hitachi VSP both scoring 13,147.87 SPC-2 MBps. Not surprising, really, but HP had the pricing edge with a $88.34 price/performance rating, compared to the VSP's $95.38. After those two, the next best was a Sun ZFS Storage 7420 rated at 10,703.69 SPC-2 MBps with a price/performance value of $35.24. 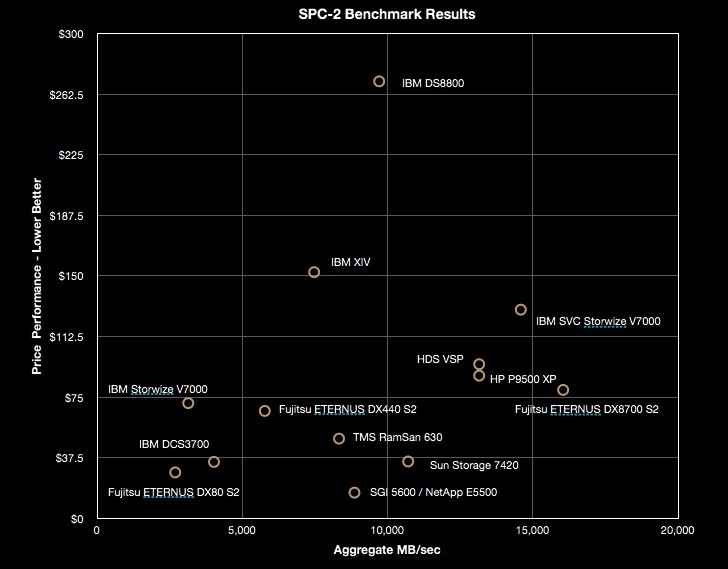 A separate SPC-1 benchmark looks at random I/O in a business environment. The all-flash V7000 was faster than a ZFS 7420 in an SPC-1 run, unsurprisingly. This SPC-2 run used all-disk V7000s, however. Fast disks are great at streaming data. The chart plots MBps values against price/performance ones, with the lower right-hand chart area representing the best mix of performance and value. We can see that the Fujitsu Eternus DX8700 S2 is in pole position for its combined performance and price/performance ratio. Perhaps HP, with its newer 3PAR (StorServe) arrays, might be able to beat the Fujitsu system. IBM is also a strong contender, if it added more V7000 nodes or went all-flash. All-flash arrays should be able to go faster than all-disk arrays, but it's difficult to see how their price/performance could be lower than all-disk arrays. Maybe an IBM FlashSystem (IBM's acquired and rebranded Texas Memory Systems) 820 could go faster and be competitive on price/performance, judging by the TMS 620's chart position.